We all lead such busy lives, and it can be hard to set aside the time to take proper care of yourself. It is so important, especially for your long-term health. It’s not selfish to refill your own cup so that you can pour into others. Self-care needs to be something we prioritize in an ongoing capacity, not something that is a one-time deal. If we only resort to self-care when our bodies are so sick and exhausted that we have no other option, we are not going to experience true health & happiness. We’ve created a challenge for you. Choose 1 small idea from each category that speaks to you to incorporate into your week next week. 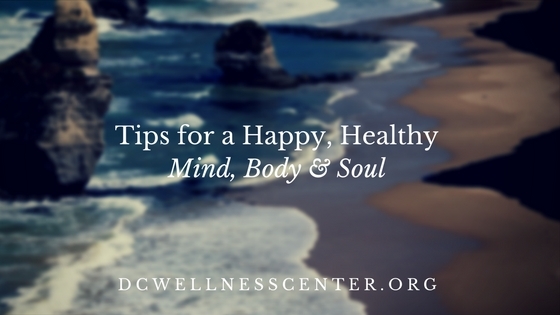 Carve out the time for three simple ways to help fuel your mind, body & soul. The following week, come back and add another. Each week, keep working to incorporate more time for yourself. Take a different route to work. Change up your routine to keep your mind healthy. Pay total attention to something that you normally give little thought, like brushing your teeth, driving to work or drinking your morning cup of coffee. Unplug for an hour (or even a half hour to start) and free your mind from the constant clutter of social media & email. Keep track of your accomplishments for the day – no matter how big or small, give yourself a pat on the back for the things you’ve accomplished. Take 5 deep breaths – actual, real deep breaths. Place one hand on your chest & one hand on your belly, feel the rise & fall of each inhale & exhale. Go for a quick run or walk to get the blood flowing in your body. Make one small change to your diet – add an extra portion of veggies to dinner, drink an extra glass of water or swap out something unhealthy for the healthy version of it. Be still. Go somewhere quiet and calm, & simply sit and be. Take a moment to check in with your emotions without judgement & just observe what you’re feeling. Write in a journal. Take 10-15 minutes to simply write whatever comes to mind whether it’s something that’s bothering you, something great that happened or even a conversation with someone close to you. Help someone else. Hold a door for someone behind you, offer to carry someone’s bags to their car or pay for someone else’s order. Ask for help! Whether it’s something big or small, reach out for help when you need it. You’ll be amazed at how little time is really needed to start feeling the benefits of taking care of yourself. What ideas will you start with this week?